Fastest to Deploy. Seamlessly Fits Any Environment. The Intermec PM43c compact mid-range industrial label printers are ready to perform. Reduce workforce training and support with the tamper-proof, 10-language, color touch-screen or universal-icon interface. 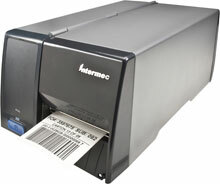 The PM43c is a third-generation Intermec industrial printer designed to maximize your uptime. Count on the PM43c to deliver quick deployment, the fastest print speed in its class, and proven reliability. 3" x 1" Thermal transfer polyester label. 5333 labels/roll, 4 roll case. 2" x 3" Direct thermal paper label. 1920 labels/roll, 8 roll case. 3" x 1" Thermal transfer paper label. 4,885 labels/roll, 8 roll case. 4" x 6.5" Thermal transfer paper label. 905 labels/roll, 4 roll case. 2.35" x 900' Black Wax-Resin Ribbon. Compatible with Desktop Printers. Single ribbon. Used with polypropylene labels. The Intermec PM43CA1230040211 is also known as Intermec Technologies	INT-PM43CA1230040211	.